Cara-Mel is an "AllStar Mixtape Awards" Nominee for "Best Unsigned Female Artist"-Voting opens April 1, 2017-May 8th, 2017 http://www.allstarmixtapeawards.com/unsigned-female-artist/best-unsigned-female-artist/ (So, I would love if everyone could show love and vote). Breast Cancer Survivor, Hip Hop/Rap Artist & Certified Personal Trainer, Cara-Mel, stops by to chat with Dini about her latest mixtape, "Racial Profile", being nominated for an "Allstar Mixtape Award" for 'Best Unsigned Female Artist' & the real lowdown on what it's like living in the DMV scene. Set your reminders, it's happening! 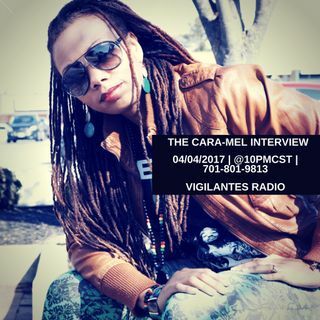 04/04/2017 | @10PMCST | Call in at 701-801-9813 | You can also hop in the mix by visiting www.onlyonemediagroup.com/vigilantes-radio-blog and slapping that "Go Live" button | Please follow our show at www.spreaker.com/onlyonemediagroup & remember sharing is caring! Be sure to follow our show there! Thanks for your continuous support!